Excellent build quality, terrific engineering and a very good crash test rating. Much better drive from 2000 onwards. Unrewarding steering, offset driving position and some problems with the 5-speed autobox. It may not have been the first of its ilk, but the Mercedes-Benz R170 SLK was the car that popularised the trend of the electric folding hardtop – an idea that went on to spawn similar models from Peugeot, Vauxhall, Ford and Nissan to name but a few. The original ‘Vario-Roof’ was first seen on the SLK II Concept Car at the 1994 Paris Motor Show, the appearance of the prototype being so close to the final production model that it was clear from the outset that Mercedes had production intent for the model. The Vario-Roof worked by means of a folding steel hardtop, divided in half along a transverse axis. By pressing a button on the centre console, the roof would lift and concertina away into a rear deck that lifted up on hydraulic rams, so it was safely stowed away in just over 30 seconds. As an engineering masterpiece, it was a sight to behold. The company’s mini-SL, codenamed R170, made its European debut in April 1996 and was previewed at that year’s Turin Motor Show. It was an instant hit. With styling cues quite clearly ripped from the bigger SL, combined with a sub-£30,000 price tag and compact dimensions, it was no surprise that there was a waiting list across Europe almost from the outset. A waiting list so long, in fact, that buyers in the USA had to wait over a year before Mercedes started importing them, and kick-started an even longer waiting list. 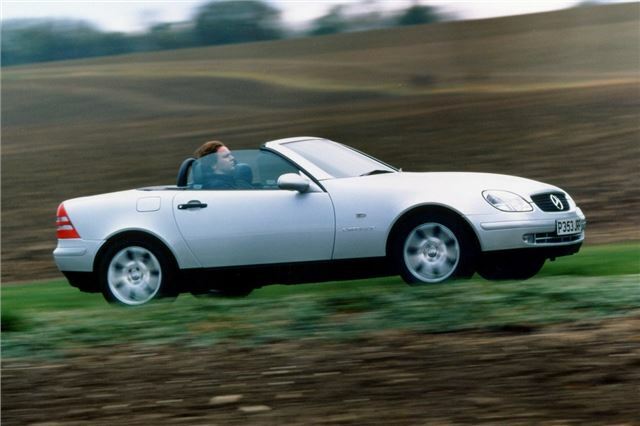 It didn’t matter one jot that the SLK’s chassis, based on a truncated C-class platform, was fairly wooden (a fact proven by the clunky, overweight Chrysler Crossfire that grew from the platform), or that the extra weight of the electro-hydraulic rams and steel roof made it considerably heavier than the likes of the BMW Z3 and Porsche Boxster that were touted as its rivals. The SLK was a sports car that didn’t need to be a sports car. Dynamics came second to the posing factor, and that was instantly noticeable as soon as you settled, rather comfortably, of course, behind the wheel. There was a semblance of performance. The 230 Kompressor, which was the only available model at launch, used Mercedes’s patented supercharging technology to wring almost 200bhp out of the 2.3-litre straight-four engine, meaning it was no slouch. But agility was never its strong point. Nor did it need to be. The SLK was all about looking good, and that was something it did in spades. It was popular, too, with over 311,000 R170s built in a production run that lasted eight years. Today, the SLK is a rising classic. 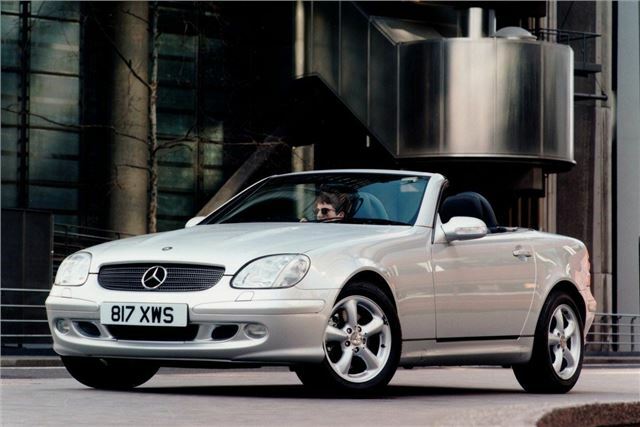 A car that offers and affordable yet stylish entry into Mercedes convertible ownership, yet is still modern enough to run every day, with faultless parts availability and a good record for mechanical reliability. That isn’t matched by the bodywork, which can rust like any Nineties Mercedes, but on the flip side, there are plenty of examples around that have been cherished, garaged and kept as second cars, and these are the ones that are destined to become future classics provided they are well rust-proofed and equally well maintained. The SLK was a game-changer, and that makes it a good choice as a future classic – look after one and the value is only going one way – an inexpensive investment, and a nice car to have around for high days and holidays.